When President Johnson's "Elementary and Secondary Education Act of 1965" was passed, the committee was quick to seize the opportunity. Application was made under Title III of the act, "New and Innovative Programs in Education", for a local Outdoor School program. "Regional Outdoor Education" was chosen as the title for the request, with the expectation that Outdoor School would certainly qualify as new and innovative. The "Regional" service area was prescribed as Metropolitan Portland, including Columbia, Clackamas, Washington and Multnomah Counties and the McMinville School District in Yamhill County (McMinnville later withdrew in favor if its own program). The Multnomah County Intermediate Education District was named as fiscal agent, administrator, and official applicant. Superintendent Errol Reese and Asst. Supt. Marcia Erickson were instrumental in organizing the effort. The original proposal for $43,620.00 was submitted to the U.S. Office of Education in early November 1965. Official written approval for the "Regional Outdoor Education" program was jubilantly received on January 28th, 1966.
office, hire a secretary, locate a suitable Outdoor site, recruit a qualified staff of resource instructors, counselors, medical personnel and cooks, compile and print Outdoor School literature, apportion 20 available class openings among the four participating counties, contact teachers, and, on April and 2, successfully conduct a weekend Teacher's in-service Workshop. Two weeks later on April 17th the first 125 sixth graders arrived at a fully prepared site at Camp Colton, near Colton, Oregon. One month later a highly successful Outdoor School session was completed after having accommodated 500 students. The outdoor school format developed by Milliken and Hamer was heavily relied on as a guide in this first endeavor. Also, for the first time, the position of "Resource Specialist", formerly a governmental agency employee, was a hired expert with similar credentials; often a retiree from the same agencies. One of the incentives for the Regional Outdoor Education program had thus been achieved, independence from overworked governmental agencies. On March 14, 1966 the name Regional Outdoor Education was painted on the door at 1441 S.E. 122nd Avenue, a new office a mile south of the Health and Education building on Glisan Street. Thus was born the ''Outdoor" branch of Multnomah County Intermediate Education District and one of its most exciting and fastest growing services. Regional Outdoor Education was conceived by a group of Portland metro area educators, governmental agency people, and industry representatives who had banded together under the name P.A.R.E.T. Committee. Their eponym was derived from the development of their first venture into outdoor instruction, the Portland Area Resource Education Tour (now Forest Park Nature Trail). Former I.E.D. Superintendent Errol Rees and his assistant Marcia Erickson were leaders in the group. 1966 Camp Colton had been chosen and equipped as the first Regional Outdoor School site, and a teacher's workshop held there. Two weeks later the first 125 excited sixth graders arrived and by mid May 500 charter youngsters had had the experience of a week in the out-of-doors school with their classes and teachers. A detailed budget for fiscal year 1966-67 and projections for the ensuing three year period were devised and submitted to U.S.O.E. by the close of the fiscal period on June 30, 1966. An Outdoor School evaluation was implemented and a start made on the revision of literature. Instead of the doubling of the program called for in the Application for Continuation Grant, the project found itself with only $16,481 left from the original grant award, none of which could be used after June 30. Immediate steps were taken to clarify the situation and a request was made for funds to continue into the 1966-67 school year. The U.S.O.E. had already committed most of the Oregon Allotment of funds, but was sympathetic to the problem. On July 19, 1966 tentative approval was given to the Regional Outdoor Education proposal, but no funds were committed. On August 14 a meeting was held in Portland with U.S.O.E. personnel and an amount of approximately $55,000 was tentatively approved for Regional Outdoor Education. On August 15 approval was given to use funds remaining from the original grant and directions were given to submit an addendum budget as of August 31. The new budget was to allow the project to keep its original permanent personnel, but operate at a reduced rate within the now-available funds. It was decided to extend the image of Regional Outdoor Education over as long a period as possible, and by cutting every corner, operate six weeks in the fall and six weeks in the spring of the 1966-67 school year. On August 24 Regional Outdoor Education submitted a ten-month budget which came very close to meeting all U.S.O.E. requirements. In mid October (the Outdoor School was in session) notification of Grant Award was received approving supplemental funds of $55,854 (the amount budgeted above what was on hand from spring) and extending the closing date of the original grant to June 30, 1967. An anticipatory clause approved expenditures to that date of issue. This brought the total amount available for the 1966-67 school year to $72,335. This did not allow the intended doubling of the participation, but was a great deal better than the demise of an infant program. The 1966-67 budget would allow only about an 8% exposure to the current crop of sixth graders in the four-county, project area. The fall, 1966 Regional Outdoor School was conducted at Trout Creek Camp near Troutdale, Oregon. It operated for six weeks, with four classes a week, for a total of 666 students. This was a departure from the spring school, when five classes attended each week, but was more in line with American Camping Association standards, dining hall and housing capacities and practical logistics. In view of the 6-day, 5-night schedule of the outdoor school program, it had been determined that by breaking the curriculum into four areas of natural "resource" it allowed four full days of learning in each of Soils, Water, Plants and Animals. Sunday arrival provided students an afternoon of settling-in to the outdoor school routine, meeting cabin mates from other school classes, and exploring the new social experience. The four weekdays were spent in the four resource area studies, each class alternating to a new resource each day. Friday was for summary, evaluation and tearful good-byes. The "right" schedule was in place. During the summer of 1966 Federal money was made available to send eight percent of the sixth graders in Multnomah, Washington, Clackamas and Columbia Counties to Outdoor School in the next school year. With a switch to the Trout Creek site some 1,303 sixth graders from 48 classes participated in fall and spring sessions in the 1966-67 school year. In the winter of 1966-67 a great deal of promotional work was done by the central staff as well as by the P.A.R.E.T. Committee. The P.A.R.E.T. Committee renamed itself the Oregon Outdoor Education Council in the hopes of assuming a larger role in the promotion of Outdoor Education in Oregon. A color brochure on the Regional Outdoor Education program was developed and the Portland and Oregon Chapters of the Izaak Walton League of America were successfully approached for $742 to cover printing costs. Assistance was also sought from the Northwest Regional Educational Research Laboratory to produce a 16mm film promoting the project. $1,000 was gleaned from the budget to help with filming costs. Subsequent negotiation with the U.S.O.E. concerning the 1967-68 Regional Outdoor Education budget disclosed that, in line with Title III policy, the project would be funded at the same level as 1966-67 and the termination date for Federal funds would be June 10, 1968. Plans for doubling the project size again would have to be dropped or another approach taken. On March 28 application was made to U.S.O.E. for $72,335 enabling a 1967-68 Outdoor School operation of six weeks fall and spring, using one site. The spring 1967 Regional Outdoor School was conducted for six weeks at Trout Creek Camp and 637 students from 24 classes were accommodated. Film was shot for the promotional movie during the last week. After the successful completion of the fall, '66 and spring, '67 sessions certain school districts within the four county area showed interest in greater participation for their sixth graders, beyond their allotment. In view of this, Regional Outdoor Education offered a "contract price" of $39 a student for additional attendance. Since the limiting factor of participation was money, this was the amount considered as the actual cost per student; exclusive of the administrative overhead borne by Title III funds. Several school districts added amounts, beyond their 8% share, in their proposed 67-68 budgets in hopes of including Outdoor School for more of their sixth graders. sixth grade classes be included. Plans for the doubling of the fall program were immediately undertaken, additional staff and two Outdoor School sites were contracted for. Both Camp Colton and Trout Creek Camp were the sites for the fall, 1967 schools which ran for six weeks with a total of 1,318 students attending. Some 648 of these attended by contract agreement. The Regional Outdoor Education project was again renewed by the U.S.O.E. at the same level, for 1967-68. By the beginning of the 1967-68 school year, enthusiasm for the Outdoor School led several school districts to request contract service from the Multnomah County Intermediate Education District so that a higher percentage of their students could participate. As a result, two Outdoor School sites (Trout Creek and Colton) were leased to accommodate the total of 2,078 students expected. Twenty-eight classes from three other counties were included. The Federally financed Regional Outdoor Education program was due to terminate on June 30, 1968 so steps were taken to assure its survival. The Multnomah County Intermediate Education District proposed that the resident Outdoor School program be added to its list of services offered the 14 school districts within the county. This proposal was accepted and Multnomah Outdoor Education was born. With nearly 9,000 sixth grade students in Multnomah County it became obvious that adequate Outdoor School sites and sufficient trained staff could not be made immediately available to serve all of the youngsters. It was decided to start with one-third or 3,000 Multnomah students the first year and expand at that rate for the next two years until all 9,000 could be accommodated. Additionally, in the interest of keeping the Outdoor Education program going in the other counties originally served by the project, the Multnomah County Intermediate Education District offered to accept contract service at the "actual cost" of each student's participation. Upon completion of the fall school, work began immediately on plans to insure the survival of the program after Federal funding terminated on June 30, 1968. The most feasible course appeared to be to continue the program as a service of the Multnomah County Intermediate Education District. Under a unique "Resolution" process in Oregon counties, individual school district boards within a county may sanction a mutually beneficial service to be supplied at the county Intermediate Education District level. In several cases, such as purchasing, data processing, etc. - and Outdoor Education - this proves to be an efficient manner in which to administer such services. At least 2/3 of the school districts must approve the action and those districts must represent at least 50% of the school attendance in the county. In Multnomah County, funds for such services derive from Multnomah County Intermediate Education District property taxes. This expenditure does not appear as part of any individual school district budget, yet the District gains directly. With nearly 9,000 sixth grade students in Multnomah County it became obvious that adequate Outdoor School sites and sufficient trained staff could not be made available to serve all of the youngsters immediately. There was also doubt whether the districts would approve such a massive plan the first year. As a result, it was decided to start with 1/3 or 3,000 Multnomah students the first year and expand at that rate for the next two years until all could be accommodated. Additionally, in the interest of keeping the Outdoor Education program going in the other counties originally served by the project, the Multnomah County Intermediate Education District charitably offered to accept contract service at the $39 "actual cost" rate. By March 1, 1968 the Multnomah County Intermediate Education District Outdoor School resolution happily had passed. In addition, the Hillsboro and Beaverton Districts in Washington County, the Oak Grove District in Clackamas County and the Sherman County Intermediate Education District (a new participant) had requested contract service for 2,000 of their youngsters. This created a potential load of 5,000 students for the 1968-69 school year, a dramatic increase in the first year of an entirely, locally-financed operation. The 1968 spring Regional Outdoor School was conducted at Camp Colton for a period of seven weeks and accommodated 760 student from 28 classes. Three contract classes from Sherman County and one disadvantaged-student contract-class from the Portland core area contributed 86 of this total and accounted for the additional week. By the end of the Regional Outdoor Education project in June, 1968, a total of 3,881 sixth grade students from 144 classes had participated in a week-long, resident Outdoor School experience. contract service accounting for 734 of these. A total of $171,608 in Title III funds and $25,505 in contract monies from school districts had been spent in two years and four months. For the first time in the state of Oregon, a large-scale Outdoor Education program was provided which cut across social and economic lines. Sixth graders with origins ranging from the isolated farm to the core-city had met in a climate of equality, with the opportunity to develop a common interest in each other as well as in the natural resources upon which their mutual future would depend. A significant cadre of educators had been prepared to reach out with the message of natural resource conservation, to more areas and levels than ever before. Nearly 150 sixth grade teachers had been involved in a concentrated, week-long, 16 hour-a-day outdoor training program; effective because it required they learn with their students while under the guidance of a staff of natural resource experts. An effective Outdoor School format had been developed and proven, which could serve as a guide for Oregon and beyond. Most important, the continuation of local financing and expansion of the program for the immediate future, had been assured. This reflected an acceptance by parents, teachers, administrators, and school board members which, in the last analysis, was the truest evaluation of the Regional Outdoor Education pilot project. Under the now, direct, leadership of the Multnomah Education Service District, the Outdoor School , program took its first county-financed solo flight. The staff was provided an undeniable challenge with the opportunity to treble the program size over the previous, Federally-sponsored, spring operation. One additional central staff person, Rudy "Digger" Bohm (an early and an accomplished participant in Regional Outdoor Education) was hired and a third Outdoor School site negotiated and prepared. Canby Grove Camp, near Canby, Oregon was developed and equipped as the new site. After a hectic training period involving some 55 part-time, paid, Outdoor School staff, 72 teachers and over 300 high school age Junior Counselors, the fall session of Outdoor School began at the three locations. After six weeks of particularly wet weather, 1,926 sixth graders had experienced a week of outdoor learning. Some 614 of these derived from outside Multnomah County by contract arrangement. With the coming of winter and the construction of individual school budgets, concern was again given to the continuation of Multnomah Outdoor Education for the 1969-70 school year. A doubling of the Multnomah County sixth grade participation was budgeted for, at an amount of $252,188. By March 1, 1969 the Multnomah County Intermediate Education District resolution had again been approved, assuring an Outdoor School experience for nearly 6,000 sixth graders in 1969-1970. In view of this portentous expansion, the Multnomah County Intermediate Education board decided against accepting the ever-larger blocks of contract service requested. Washington County was encouraged and assisted in developing a similar Outdoor Education program through it's Intermediate Education District by resolution. With the advantage of using the proven Regional Outdoor Education format and all it's applicable literature, and with the positive image already achieved through the heavy contract involvement of Hillsboro and Beaverton District students, the outlook was bright. Everyone involved was gratified when the necessary majority of Washington County districts approved the resolution. Every one of 3,000 sixth grade students in Washington County would become involved in their own Outdoor Education program in the 1969-70 school year. Rather than take the county-based "Resolution" route several school districts in Clackamas and Columbia counties took the course of devising their own Outdoor School programs. Those that developed a strong commitment produced eminently successful programs using largely volunteer staff and ardent parent support. Volunteerism was the key to their strength. Outdoor school was well on its way to universality in the original "Regional Outdoor Education" concept. In the 1968-69 school year the program doubled in size with 4,857 students participating, 1,952 of them from the Hillsboro, Beaverton and Oak Grove Districts and from Sherman County. In addition to Trout Creek and Colton, Canby Grove Camp was added in the fall and Camp Adams the following spring to handle the increase. Mr. Rudy Bohm was added to the Outdoor Education staff as an Outdoor Education Specialist on a nine-month contract. Bohm had joined the program as a part-time employee in its first session and has been a constant contributor. Meanwhile, Multnomah lED Outdoor School was planning for four Outdoor Schools in the spring of 1969. An additional site at Camp Adams, near Colton, Oregon was negotiated and prepared and the task of recruiting and training a total of 75 part-time, paid staff, 112 teachers and 500 Junior Counselors was undertaken. At the end of the seven-week spring session, 2,931 youngsters had completed a week in the outdoor classroom. Of these, 1,593 attended by Multnomah County resolution and 1,338 by contract service. In the first year of entirely local sponsorship, Multnomah Outdoor Education (the outgrowth of the Title ill, Regional Outdoor Education pilot project) had directly served a total of 4,857 sixth graders from five counties. Contract attendance amounted to 1,952 students. Some 184 classes and teachers had participated and over 1,000 paid staff and volunteer teachers had been recruited and trained. All of these figures were substantially more than took part in the entire 2 1/4 years of the Regional Outdoor Education pilot project, contract attendance included. A study of the declining cost-per-student rate is also an indication of the experience and efficiency gained while under the Title III Regional Outdoor Education pilot project. In the first complete year of the project (1966-67), the cost per student came to $55.51. As contract participation broadened the base in numbers of children, the cost dropped to $46.83 per youngster in 1967-68. In the 1968-69 year the cost was approximately $42.57 per student and in 1969-70 about $42.03. It was to be expected that sixth grade students would have enthusiasm for Outdoor School and with adequate financing and experienced leadership, a good plan could be made to work. However, the results of the Regional Outdoor Education program exceeded expectations in several outstanding ways. Probably the single greatest change of any type that has affected the local education institution has been it's awareness of Environmental Education. In this day of increasing talk about innovation in educational methods and teaching environment, the Outdoor School appears as a living, breathing demonstration of providing relevancy to learning. Outdoor Education is an exciting departure from the traditional indoor, book-blackboard-lecture type of classroom. In an effort to transmit understanding about such all-encompassing and complex subjects as "Nature" and "Conservation", Outdoor Education spills out into the fields and forests to involve all the senses of highly motivated students. It is practical application of the "learn by doing" precept. The resident outdoor program, by serving an area that contains half of the people in Oregon, has had a profound effect on their environment awareness. Teachers and school administrators who have personally participated in the project have been universally enthusiastic in their praise of the experience. Teachers, thoroughly oriented to teaching inside the four walls of a classroom, have accepted this new outdoor teaching environment as one of the most stimulating developments in the field of education. After completion, only a handful of complaints originated over teachers having to leave the home classroom to spend 24 hours-a day for five days in the out-of-doors learning environment. Certainly Regional Outdoor Education was not the only influence on local schools towards accepting Outdoor Education, but it was a major contributor. It offered actual experience for student and teachers rather than educational theory. Multnomah Outdoor Education, the locally-financed outgrowth of Regional Outdoor Education, has since become the largest resident Outdoor Education program in the Northwest, with some 7,000 sixth graders scheduled for participation in each school year. The use of high school students as cabin group counselors has proven to be one of the outstanding and unique features of Multnomah Outdoor School. It has developed as a highly successful and mutually profitable undertaking. These fine young people, mostly former sixth graders at Outdoor School, have learned to accept the responsibility of their task in a truly adult manner. Being the hero-image of the sixth graders, places them in the position of being super-conscious of the example they set for youngsters. Their performance as leaders of children has been outstanding. Their daily contact with sixth graders is greater than with any of the rest of the Outdoor School staff, and they seem to establish a rapport with students that is unique to their age group. At the Outdoor School, high-schoolers usually have their first real opportunity to apply what they have been merely talking about in school. They learn firsthand about character development, responsibility, discipline, leadership, and influencing others. Most have said that this counseling responsibility was the greatest learning experience of their lives. Many Junior Counselors have related that if this is education, they want to take a serious look at teaching as a profession. That high school administrators have realized the worth of the Junior Counseling experience for their students is attested by their continued eager willingness to supply high school students as counselors. Many alumnus Junior Counselors have moved up to Senior Counselor positions at the Outdoor School as they graduated from high school. Carefully selected on the basis of past performance, these young men and women have performed notably in the more responsible positions of Resource Specialist and even Site Supervisor. Instrumental in the development of this outstanding, youth-leadership program for high-school students was Miss Diane Milleman, a participating 6th grade teacher. By her exceptional ability to influence and train high-schoolers, she distinguished herself and eventually became a central staff member for Outdoor School. Thanks to the early programs of Outdoor Education in Oregon, a format developed which involved small cabin-group living units, under the guidance of high school Junior Counselors. Visits to other Outdoor Schools nationwide revealed that most featured dormitory living with up to 50 students housed in one building, a far cry from the 8 to 10 students standard in Multnomah Outdoor School. This cabin grouping gives the Junior Counselor the best opportunity to develop close rapport with their wards, and many developed close friendships lasting for years after. Cabin esprit-de-corps developed as the week progressed and became a basis for cabin group competition on closing days and at campfires. The restriction of the Regional Outdoor Education resident program to fall and spring operation has proven a blessing in disguise. A study of Northwestern Oregon weather shows that 80% of the local rainfall comes between November 1, and April 1, some 15% during September - October and April - May, and 5% during June, July and August. Allowing time for teacher and counselor outdoor workshops, this restricts fall and spring Outdoor School operation to a maximum of no more than seven weeks a session. At present, summer school vacation times and site availability disallow summertime operation. Contrarily, however, due to the 16-hours-a day nature of Outdoor School, the factor of staff fatigue becomes an important consideration. It has been found that a six or seven week period is about the limit of staff energy and enthusiasm when measured by Multnomah Outdoor School standards. Comparison of Multnomah Outdoor Education staff performances with those of Outdoor Schools where weather allows full-school year operation, leaves little doubt that longer term operation seriously affects staff performance. One of the original concerns of the creators of the Regional Outdoor Education was the shortage of qualified natural resource specialists who could be called upon to teach at workshops and Outdoor School. It had previously been the habit of the few resident Outdoor School projects in the state to ask for governmental natural resource agency specialists as instructors. Obviously, their number was limited and their time largely taken up with their own duties. 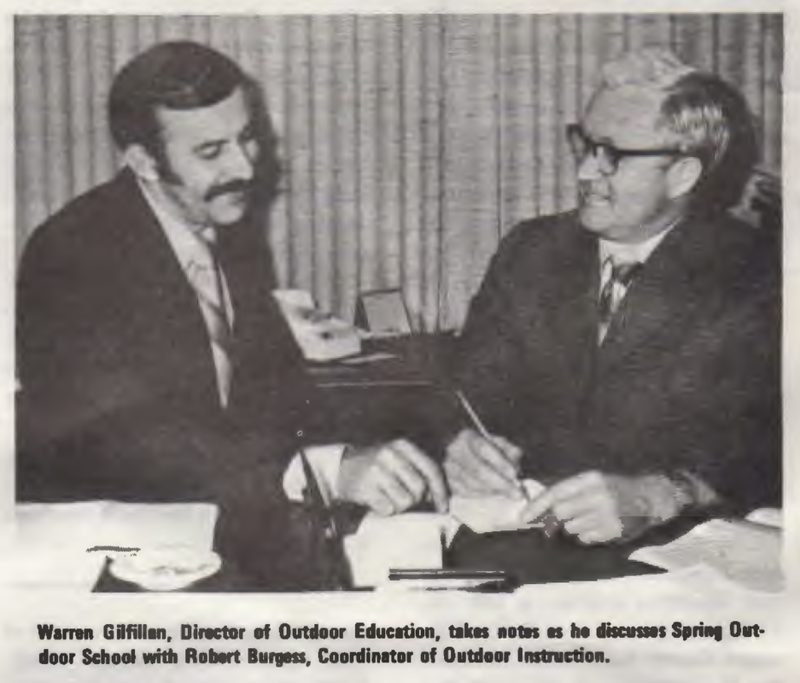 Aside from the initial pilot session in the spring of 1966, Regional Outdoor Education has recruited, hired and trained its own staff of resource specialists from the open market. The principal, early source was from the ranks of retired but still active resource agency people. The obvious major problem has been finding technically proficient people who, at the same time, could reach sixth graders in the outdoors at the child level. That this direction was proven successful is corroborated by the very success of the Multnomah Outdoor Education instructional program. Teachers are always offered the option to organize and direct the outdoor instruction of their classes themselves. This is a task that is rarely accepted when teachers realize that teaching in the boundary-less outdoors, with excited, exploring students is difficult, by themselves. Teachers feel uninformed as to the physical phenomena offered on the site and seldom have the depth of background in every subject matter covered at Outdoor School. They soon realize that a college-trained, experienced expert in the subject field of the day, backed by a Senior counselor and several Junior counselors (all trained by the expert) can best distribute and monitor the knowledge to be attained. A high teacher-student ratio gives every student a chance to learn the handful of all-important concepts about their environment that can be understood by children. That the "Resource Specialist" approach to outdoor learning is embraced by participating teachers is proven by years of universal acceptance. Teachers feel they can work individually with needful students, monitor the progress of the class and learn themselves - all at the same time. No loss! The use of the specifically assigned "ecological field study plot" as an Outdoor Classroom for each class has proven a superior extension of the "home " classroom. Assuming that understanding the idea of ecology as among the most important of nature concepts, the use.of a single piece of land on which students can study all realms of natural resource has proven a wise development. Rather than taking a field trip to a place removed to study one facet of Nature and another excursion to study another, students come to realize that all elements of Nature exist side by side, right on their own piece of land. As a result "ecology" becomes more understandable. Resource specialists can develop to the fullest the physical phenomena found there and guide students to "discover" these. The outstanding cooperation of youth-camp owners whose camps have been leased for Outdoor Schools is but one demonstration of the value of this approach to acquiring Outdoor School facilities. Camp owners have offered special rates and have continued to improve and " winterize" facilities, to better accommodate their Outdoor School tenants. Owners realize that summer camp facilities are better "in-use" rather than lying dormant nine months of the year, and that the Outdoor School uses the site when no other group would. Nor does Outdoor School use preclude weekend use by owner groups. There is not one private or public youth camp in the northwest which does not operate at a deficit. Outdoor School lease fees assist every owner to overcome some of this deficit operation. For Outdoor School to own its own facilities, when presently limited in operation, would be to place the Outdoor School in the role of deficit operator. When one considers the tremendous capital development and maintenance costs involved in camp ownership, leasing is good business and a two-way street for owner and Outdoor School user alike. Previous fears expressed by youth serving agencies over the possible conflict between Outdoor Education and their own programs have been virtually eliminated by this open display of cooperation. Rather, youth camping organizations have found their own summer camp enrollment increased by Outdoor School youngsters who have been introduced to the pleasures of outdoor life. The 1969-70 participation excluded contract schools but rose to 5,943 students from 229 classes in Multnomah County. This was approximately two-thirds of the available sixth graders; Mr. Martin Kuns,long time participant in the program joined the staff as a nine month Outdoor Education Specialist. Happily, as a result of the impetus provided by the Regional program and contract help from Multnomah County, Washington County Intermediate Education District was able in 1969-70 to initiate their own resident Outdoor Education program for 3,000 sixth graders annually. Clackamas County is following close behind with a full time Outdoor Education Director employed.